Were spent in large part recovering from the garden planting adventure. Not only have I been tired but also sore . But not so badly off that a good time was out of the question. Went shopping and to lunch with daughter #2. Neither of us bought anything. I could use some pants because mine are quite old and too big, but I am not a skinny leg jeans person and that seems to be the style, along with jeans with gaping holes. Egads. I have not looked at Goodwill. It's always crowded and makes me claustrophobic. Soon enough I will be wearing capris of which I have plenty. I need to go through my closets and purge some things but seem not to be inspired in that direction. Or really in any direction. Thus have been watching more video than usual. Binged on "Wormwood" on Netflix. It's not as if my paranoia about the government needs feeding, but if it did this docudrama would be a tasty meal. Today I've watched "Harlots" via Hulu. If nothing else appeals to me about this series, I do love the costumes. Of course everyone looks much cleaner onscreen than I'm sure they truly were and I know those wigs were crawling with lice, still I will watch just for costuming. 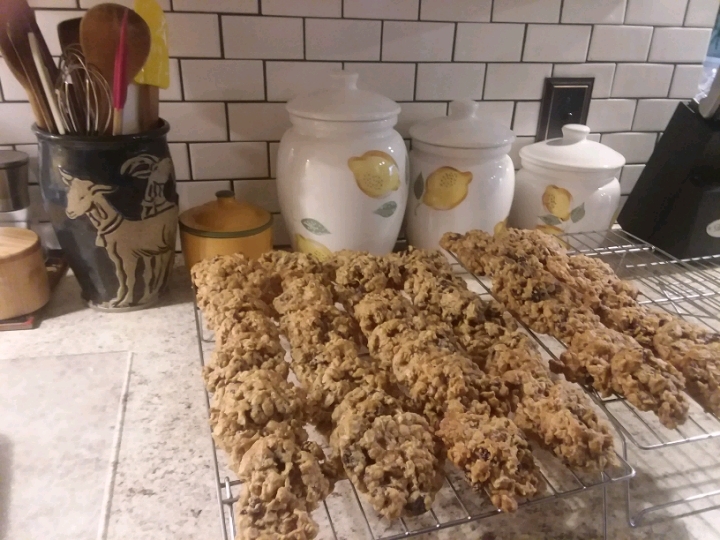 The husband mixed up raisin oatmeal cookies and I baked them. Now roasting chicken wings. Daughter #1 made a delicious Thai veggie noodle dish and shared with me. It's been raining off and on and remains gray. Took a morning nap. Still need to buy mustard seed. The heaviness of the air makes me drowsy, but I'm staying awake long enough to eat chicken wings. Time to turn the heel on the sock I'm knitting, all this tv watching goes well with knitting. I want oatmeal cookies now!!!!! Today was a baking day here too. Mexican chocolate oatmeal cookies. No baking for me, but I did watch all four freakin' hours of "Gone With the Wind". Does that count as binge watching? OK, first I could smell them, then you tortured me with a description of them, and now you post this picture. Honestly, E, where does this end? I love your backsplash and containers. Nice mix! I miss oatmeal cookies, They were my favorite! Sounds like a relaxing time and all enjoyed.